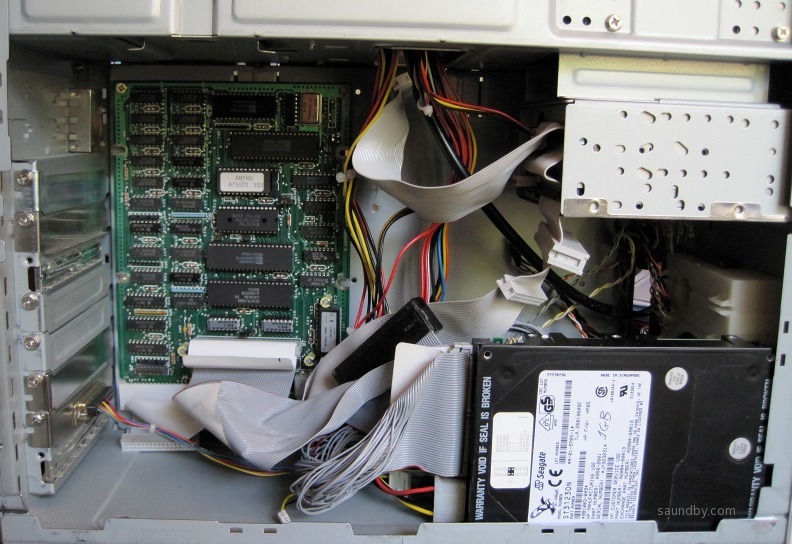 Fits on top of a 5-1/4" disk drive and addresses up to 88MB of SCSI hard disk drive. 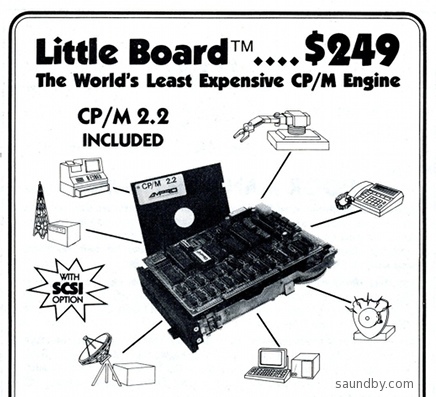 The original "Bookshelf Computer", the Ampro Little Board Z-80 is one of the simplest old computer system boards to get up and running. What made us want this system so bad back in the day? See the advertising that turned us on to this slick little system! See how I built up my Ampro Little Board System, and how I use it. 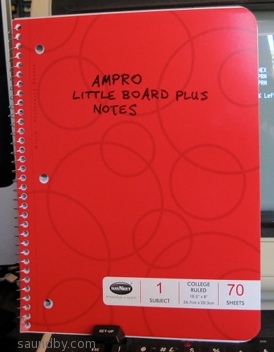 How I first brought up the Ampro. Using the Ampro with nothing but the included software. ED for editing, ASM for compiling assembly code. How using the Ampro to program in 8080 assembly code inspired my 8085 project. Setting up the Ampro in a new location, with a new terminal. Once you've got an Ampro Little Board Plus system, what do you do with it? See ads and information on the software I'm using with it here. I'm not done with this system yet. A real time clock. I have a daughterboard made just for the Ampro that adds one. On a quiet afternoon, I'll install it and get the software checked out. Blue sky: I have a PCB for a 1MB RAM expansion. It appears to mainly be intended for RAM disk, which I don't feel a strong need for at present. But I may add this later just as a matter of "tricking out" the system even more. Retrocomputing is a team sport. Ampro Manuals courtesy of Harte Technologies. 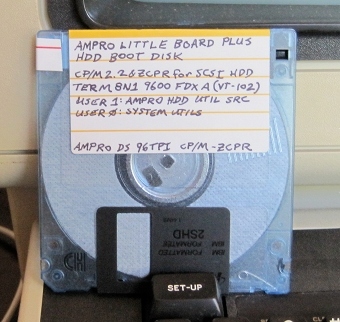 Ampro Floppy Disk Formatter Source Code decompile by the CBIOS Boneyard. Finally, I'd like to thank IQ Technologies (now the Smart Cable Company) for their wonderful serial SmartCable. It's worth its weight in gold. I bought it many years ago (about '84 or '85) after a particularly frustrating bout of trying to get a couple of pieces of equipment to talk. I felt like I was paying through the nose for it at the time but it has repaid me many times over, and continues to do so. You can still get one! Do so, and don't worry about the price. It's worth it!